There are tons of hookup dating sites out there for people to join, you’ve probably been a member on at least one of them. Some are better than others but the one thing they all have in common is that they all have fake dating profiles on them. If you use hookup dating sites then it’s a good idea to know how to spot fake dating profiles so you can avoid them. The first thing you should be aware of is the type of site you’re using. Some dating sites require paid membership and others are free. There are more likely to be fake profiles in the free sites because anyone can join and they can make as many profiles they want as long as they use different emails. With paid sites they would need a valid credit card to sign up. If you are using a free dating site then pay extra attention to the profiles. The easiest way to spot a fake dating profile is by actually taking the time to read it. Someone who is putting up profiles in order to scam people won’t bother taking the time to fill it out properly but those who are seriously looking for someone will. If they just have the bare minimum information on their profile then chances are it’s a fake. Another thing to look for is the grammar they use. If they can’t spell words correctly or can’t form a proper sentence then they could be a scammer whose first language isn’t English. A lot of scammers target people on dating sites because they know they can offer false promises to lonely people. Also take time to look at their picture. 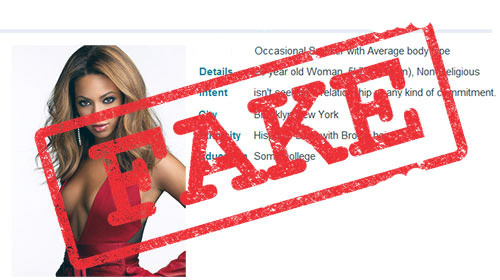 Fake profiles usually use pictures from the internet so see if it’s an obvious photoshop or even a picture of a celebrity. Do they have more than one picture posted? If they have different pictures containing the same person then there’s a higher chance of them being legit. If you come across a profile and you’re not sure if it’s real or not then shoot them a message. If you get a one word reply like “Hi” then they’re either fake or not interested. Move on. If you find someone and you’re not sure about them then ask to Skype. If they’re using fake pictures then they’ll come up with an excuse for not letting you see them. If they tell you to go to another site where they have a more complete profile then dump them immediately. It will probably be a cam site or a pay site that they want you to join. If you are tempted by this person then don’t give out any personal information you don’t know the site or what they will use your information for. If you come across an obviously fake dating profile then report it. A reputable site will want to protect their reputation and will delete the fake profile. Next time you’re on a hookup dating site take a careful look at the profile so you too can avoid the fake ones. This will save you a lot of time and frustration as you try to find the perfect hookup.